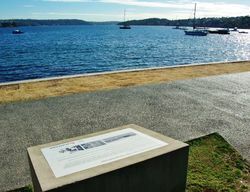 A monument commemorates the 75th anniversary of QANTAS, and the last major flying boat base in Australia. 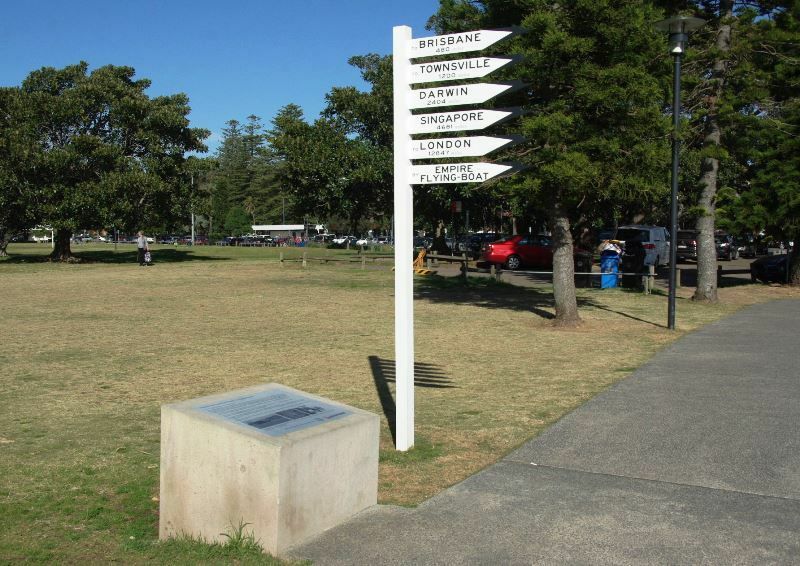 This is the site of Sydney`s first international airport. 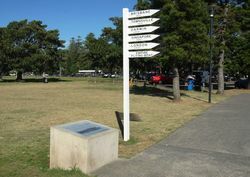 By arrangement between the Commonwealth Government, QANTAS Empire Airways and Imperial Airways, Lyne Park became home to the Rose Bay Flying Boat Base in 1938. Operating between Sydney and London the service was initially used to transport passengers and air mail. The journey took nine days in total, with QANTAS flying the Sydney to Singapore leg in three days, and Imperial Airways flying the rest of the way. This first leg included stop-offs at Brisbane, Townsville, Groote Island, Darwin and Surabaya in Indonesia. During World War II the base came under defence control and was expanded to host a large force of military flying boats and sea planes, before reverting to civilian use at the end of the conflict. Rose Bay remained an international terminal until the 1950s when Mascot took over the role. The flyiing boats then changed destinations and began flights to New Zealand and the Pacific Islands. By the 1960s the base was primarily used for tourism, before closing permanently in 1974. The only building remaining from the Flying Boat Base is the former RAAF Officers` Canteen, which is now a Scout Hall. If you follow this path east to Vickery Avenue, you will see it across the road. Seaplane charter flights showcasing Sydney`s spectacular coastline have continued to operate regularly out of Rose Bay since the end of the flying boat services. 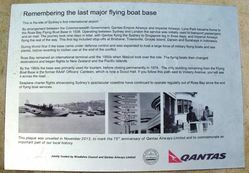 This plaque was unveiled in November 2013, to mark the 75th anniversary of QANTAS Airways Limited and to commemorate an important part of our local history.